A majority of the reviewers claimed that the Adidas Cloudfoam Revival Mid is really soft inside. Most reviewers said that the shoe is definitely lightweight. A handful of reviewers praised the comfortable feeling they get when wearing the shoe. Some of the buyers are highly appreciative of the stylish look of the shoe. A few reviewers described wearing the shoe like walking on clouds. A good number of buyers said that they would definitely recommend the shoe to a friend. One reviewer expressed that the Adidas Cloudfoam Revival Mid is his favorite athletic shoe. A variety of colorways for the shoe are available to choose from. The shoe can be purchased at a budget-friendly price. Some reviewers complained about how it was not that easy to put on and take off the Adidas Cloudfoam Revival Mid. A basketball-inspired shoe that delivers great performance, as well as great comfort, is what the Adidas Cloudfoam Revival Mid is all about. The Cloudfoam technology of the shoe provides the needed comfort and a great lightweight feeling for the wearer. With great colorways to choose from and with its affordable price, one can almost never go wrong with these pair of kicks. As a new technology from Adidas was given birth, the brand trusted the YouTube platform and partnered with two of its stars, Amanda Steele and Marcus Butler, to introduce the Cloudfoam technology to the world. The Adidas NEO Cloudfoam silhouette that showcases a solid outsole with a stylish cut but a soft and lightweight cushioning gives the foot great comfort. One of the models showcasing this technology is the Adidas Cloudfoam Revival Mid which is a basketball-inspired shoe. When the shoe was released, it featured a Cloudfoam DUAL LAYER sockliner, which combines a memory foam and the Cloudfoam to provide a long-term comfort for the foot. A coarse woven mesh with graphic details on the heel covers the upper as well as a seamless matte three-stripes branding on the sides and heel strap. The Adidas Cloudfoam Revival Mid is a combination of athletic and casual style. Since it is a basketball-inspired shoe it readily shows off its athletic side. Its modern look and charm complete the shoe’s multi-purpose appeal. It offers the kind of versatility that sneaker fans can never get enough of. One can wear these kicks when going out with friends as a complement for a street style outfit. The shoe can go well with a pair of jeans, joggers, or jogger jeans. The Adidas Cloudfoam Revival Mid provides great fit for the wearer. The traditional lace-up closure of the shoe allows the wearer to adjust the shoe in a comfortable fit. Additionally, the mid-cut construction provides enhanced hold and support for an active lifestyle. 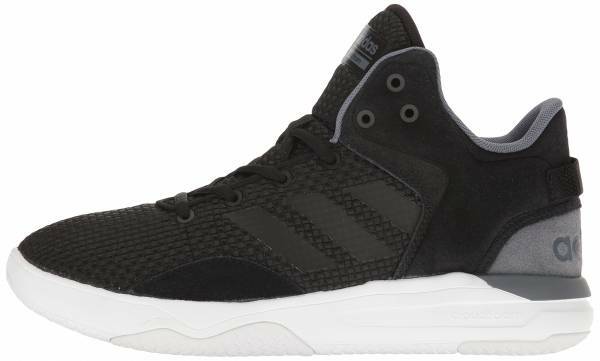 The Adidas Cloudfoam Revival Mid is offered in men’s sizes ranging from size 6 to size 14. Half sizes are also available. The shoe also fairly runs true to size. The comfortable and lightweight feeling that the buyers felt when they wore the Adidas Cloudfoam Revival Mid is what they really loved about the shoe. These were always the first things they noticed as soon as they put on the shoe. They loved how they felt like they were walking on clouds when wearing it. Also, the stylish design of this sneaker immediately caught the eye of both buyers and onlookers. Adidas uses a knit upper instead of the woven mesh upper with the latest releases of the model. A comfortable textile lining is observed. Rubber inserts are added on the outsole of the shoe.